Trampa de luz ultravioleta CDC miniatura. La entrada de los mosquitos es por la parte superior. Funciona a 6 Volts (batería G8111) y lleva incorporada célula fotoeléctrica. Con malla fina, permite la captura de Culicoides y otros mosquitos que son específicamente atraídos por UV. Dispositivo de recolección en seco. Disponible recambio del tubo de luz negra de 4 Watts (G8051). Siempre en stock. Fabricada en USA. Se sirve con dispositivo de recolección en seco. También se pueden conservar las muestras en líquido (alcohol) con el dispositivo ref. G8521. The New Standard Miniature BlackLight (UV) Trap uses maximum airflow and an internal super-efficient transistor ballast to drive a 4 watt blue-blacklight tube for superior catch results. The internal programmable photoswitch can control any combination of motor and/or light on and off at dusk and dawn. 4 Watt blue-blacklight tube draws superior catch results. Features an internal super-efficient transistor ballast. 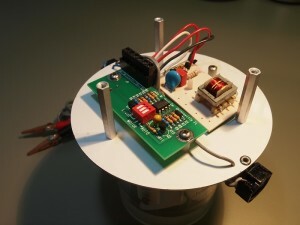 Control motor and light with programmable photoswitch. Use with collection cup or killing jar. Downdraft fan keeps catch in the collection bag. The New ABS formed rain shield and clear acrylic body reflects and transmits light downward like a street light as well as straight out. The new PhotoSwitch, unlike any on the market today delivers 100% of battery voltage to the light and motor. This means that the BlackLight (UV) Ballast and light can operate from a 6 volt battery. The new PhotoSwitch delivering 100% of battery voltage means motor RPM’s are ca. 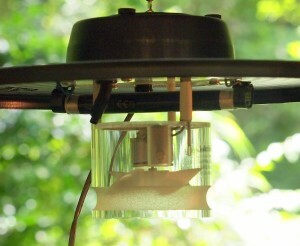 20% greater than other miniature light traps using PhotoSwitches. Coupled with our low-silhouette grill, air flow in substantially superior to other models. The trap can be programmed into the various modes without a magnifying glass or tweezers… and, no jumpers to lose. The motor can be replaced with only a screwdriver. The internal programmable photoswitch can control any combination of motor and/or light on and off at dusk and dawn. Mode 1 Motor & light on at dusk, both off at dawn. Mode 2 Motor & light on at dusk, light off at dawn, motor remains on. Mode 3 Motor & light independent of light level, connected traps runs. Red de recambio para G850, G852 y G853. Ventilador de recambio para trampas CDC G850 y G852. Lámpara de recambio de luz blanca para G850. Motor de recambio para trampas CDC G850 y G852. Circuito de recambio para trampa CDC G852. Célula fotoeléctrica para trampa de luz CDC G853 (6 voltios). Vaso de 500 ml para los anteriores dippers F409 y F4090.